Francis imitated Christ so perfectly that towards the end of his life our Lord wished to point him out to the world as the faithful imitator of the Crucified, by imprinting His five wounds upon his body. “Francis was raised to God in the ardor of his seraphic love, wholly transformed by sweet compassion into Him, who, of His exceeding charity, was pleased to be crucified for us. On the morning of the feast of the Exultation of the Holy Cross, as he was praying in a secret and solitary place on the mountain, Francis beheld a seraph with six wings all afire, descending to him from the heights of heaven. As the seraph flew with great swiftness towards the man of God, there appeared amid the wings the form of one crucified, with his hands and feet stretched out and fixed to the cross. Two wings rose above the head, two were stretched forth in flight, and two veiled the whole body. “Francis wondered greatly at the appearance of so novel and marvelous a vision. But knowing that the weakness of suffering could nowise be reconciled with the immortality of the seraphic spirit, he understood the vision as a revelation of the Lord and that it was being presented to his eyes by Divine Providence so that the friend of Christ might be transformed into Christ crucified, not through martyrdom of the flesh, but through a spiritual holocaust. Thus far the account of St. Bonaventure. 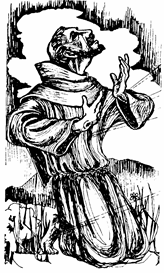 Although St. Francis strove in every way to conceal the marvelous marks which until then no man had seen, he was not able to keep them a complete secret from the brethren. After his death they were carefully examined, and they were attested by an ecclesiastical decree. To commemorate the importance of the five wounds, Pope Benedict XI instituted a special feast which is celebrated on September 17th, not only by all branches of the Franciscan Order, but also in the Roman missal and breviary. 1. With the example of our holy Father St. Francis in mind, consider what effect a glance at the cross should have on us. It led Francis from the service of the world to the service of God and to penance. A look at the crucifix should remove from our hearts all delight in the world and fill us with sorrow for the sins we have committed in the service of the world, and of our evil passions. For what other reason was Christ nailed to the cross, and his whole body bruised? The Prophet tells us: “He was wounded for our iniquities. He was bruised for our sins” (Is 53:5). Meditation on the sufferings of our Savior caused St. Francis to shed so many tears that his eyes became inflamed. — Do you also kneel before the crucifix and bewail the sins through which you nailed your Savior to the Cross? 2. Consider that a look at the cross is also a consolation for the sinner. Our crucified Lord assured St. Francis of the complete remission of his sins. The Prophet also tells us: “By His bruises we are healed” (Is 53.5). Moses gave us a picture of our Savior on the Cross when he raised a brazen serpent on high in the desert, so that those who had been bitten by the poisonous serpent in punishment for their murmuring might be healed by looking up to this sign of our redemption. On the crucifix you behold our Savior Himself. “Behold the Lamb of God; behold Him who takes away the sins of the world” (Jn 1:29). — Look up to Him with sincere contrition and lively confidence; He will also take away your sins. 3. Consider how the contemplation of the Crucified finally pierced St. Francis through and through with the fire of love, so that our Lord made him even externally like Himself. A look at the crucifix should also awaken ardent charity in us. St. Augustine points this out to us when he says: “Behold the head that is bent to kiss you, the heart that is opened to receive you, the arms stretched out to embrace you.” Do not look at the image of your crucified Savior in the cold and indifferent way that one looks at a work of art, to marvel at the painful expression there represented. Let it speak to your heart and let your heart speak to it. Serve Him faithfully so that you may one day be united with Him in eternity. O Lord Jesus Christ, who when the world was growing cold, didst renew the sacred wounds of Thy sufferings in the body of our holy Father St. Francis in order to inflame our hearts with the fire of Thy divine love, mercifully grant that by his merits and intercession we may cheerfully carry our cross and bring forth worthy fruits of penance. Who livest and reignest forever and ever. Amen.